May 3rd, 2013 | Moving Tips, News and Events, Wheaton World Wide Moving. 2. Sketch a floor plan. Once you know the layout of your new house or apartment, sketch out a floor plan for each room. Scaling these plans to actual size will help you know what furniture you should and shouldn’t take depending on how much room you have in your house. Take a tape measure when you visit your future home. Measure the baseboards of each room and make sure you keep in mind all doorways, closets, electrical outlets, or other built-in features. Buy graph paper. 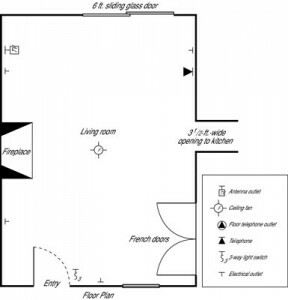 Once you’ve sufficiently measured the room, you’re ready to begin your sketch. Use different colors or line thickness to indicate the difference between walls, doorways and windows. Don’t forget to indicate where those electrical outlets are – there’s nothing worse than putting a heavy couch in front of the only outlet in the room! If you want to plan wall hangings and art, make sure you indicate the height of the walls. What else do you usually include in your room sketches? Wheaton has tons more moving tips in our archive.